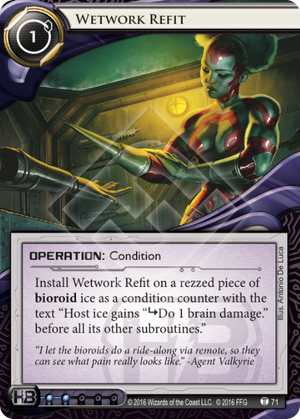 Install Wetwork Refit on a rezzed piece of bioroid ice as a condition counter with the text "Host ice gains "subroutine Do 1 brain damage." before all its other subroutines." I love to take cards that are kinda meh and watch them punch above weight in a certain type of deck. Not necessarily make them good, but make them do more than someone expects from them. That is the best you can hope for here. First -- against the wrong kind of deck, this does nothing. And don't even talk about Yog.0 and Viktor 1.0. Ugh. In that sense, call it a meta call. Everyone is using Lady lately with no back-up? Give Eli some teeth.